Note: Registration deadlines are two weeks prior to the start of the camp. Just like Charlie Elliott in his youth, campers will gain new outdoor skills while they hike forest trails, explore waterways and search for wildlife evidence. Live animal encounters, games and crafts are also planned for this week of fun and adventure. Wildlife Rangers will travel back in time to imagine what life was like for the Native Americans and early settlers of this area. 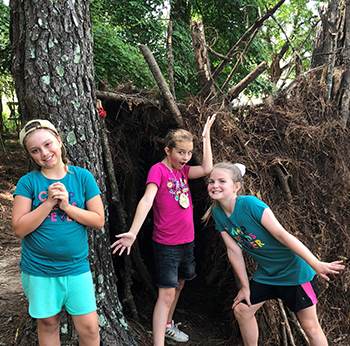 Campers will learn basic survival skills such as shelter building, outdoor cooking, animal tracking, fishing, canoeing, archery, games and old-time music. This camp also features a Thursday night campfire and tent camp-out, with parent pick-up Friday morning! iC.A.N. Camp will explore the many ways citizen scientists help to conserve animals in nature! Campers will learn how to use technology in the outdoors to discover what biologists do in the field. Hiking, nature play, live animal presentations, and other outdoor skills are just a sampling of the fun activities planned for this camp. Come ready to learn about all kinds of critters found throughout the state of Georgia! For more information on day camps, please call 770-784-3059 or 770-784-3121. Camp TALON is a five-day camp for teens interested in birds and nature. Sponsored by the Georgia Department of Natural Resources, the Georgia Ornithological Society, and the Atlanta Audubon Society, participants get a chance to experience birding on Little St. Simons Island, Wassaw Island NWR, Sapelo Island, Harris Neck NWR, Jekyll Island, Altamaha WMA, and St. Simons Island. Hosting 16 students, ages 12–16. Older students may be eligible. More details and how to register. Teamwork and team spirit abound as campers work together to complete challenges using the outdoor skills they've learned and developed throughout the week. This is a fast-paced, high energy camp. Camp days will be brimming with outdoor pursuits such as hiking, canoeing, fire building and wilderness survival. Our trained and certified counselors will guide campers along their journey culminating in an all-out, every team for themselves competition. We will highlight ideas from The Garden Club of Georgia; have programs on attracting birds and butterflies, fishing, outdoor recreation, a night hike and just enjoying the quietness outside the city. Register by June 1. To register, or for more information, contact Molly Kimler at 770-464-3589 or mkimler@gmail.com. We've expanded and improved this popular camp. Campers will receive hands on instruction from DNR professionals in archery, shotgun, air rifle and .22 rifle. Campers will also get certified in NRA’s 1st Steps Shotgun and Rifle program and earn various marksman badges. ACE is a unique workshop/camp for middle school students focusing on wildlife conservation. Participants will spend five days immersed in Georgia wildlife via hands-on activities and day trips. Are you a young person interested in expanding your knowledge of outdoor skills? If so, Charlie Elliott’s Wilderness Survival Camp is just for you! Come and join our team of experienced naturalists as they take part in various activities meant to sharpen your ability to stay healthy and alert in dangerous wilderness situations. We will explore such topics as primitive fire building, edible and medicinal plant use, wilderness first aid, the building and setting of snares, shelter fashioning, and much more! We’ll also find some time for other recreational activities like camp games, canoeing, and archery. Come prepared to walk away as an expert outdoors person, to gain some knowledge, and to have a lot of fun along the way! For more information on overnight camps, please call 770-784-3059. Full payment and all required forms below must be completed and submitted by the registration deadline in order for your child to attend summer camp. A limited amount of registration packets are available at Charlie Elliott Wildlife Center. Register early! Space is limited. Full paperwork includes Registration form, all Camper Health Record and Emergency Information Forms, Behavior Standards, an immunization record signed by a doctor and Participant and a Minor Waiver Release Form. If you turn in an incomplete packet, you will be wait-listed and notified of your missing forms. If you wish to opt out of the immunization record for any reason, you must fill out this affidavit.